9 August. As rumours mount of a Japanese surrender, Sukarno, Mohammad Hatta and Dr Radjiman Wediodiningrat fly to Saigon and on to Dalat in the Vietnamese highlands. Here, Field Marshal Terauchi Hisaichi, commander of Japanese forces in Southeast Asia, personally assures them that independence will be granted on 24 August. Sukarno is appointed chairman of the PPKI, whose first meeting is planned for the 18th. 13 August. An all-country conference of the Indochinese Communist Party begins in Tan Trao, centre of a liberated zone north-west of Hanoi, the first such conference held in five years. Reflecting the dramatic news of an imminent Japanese surrender and fears of both a French return and Chinese intervention, delegates resolve that both the Soviet Union and the United States be won over to the Vietnamese cause. In addition, a five-man ‘Uprising Committee’ is established and orders go out that lead to some attacks on Japanese forces. However, by the time the conference ends on the 16th, delegates agree on a policy of caution in the uncertain strategic situation. Vo Nguyen Giap rehearses with his propaganda brigade. This is the first of a six-part ** ‘Special Edition’ ** that presents all Vietnamese material in a single location. Click for Part II, Part III, Part IV, Part V, Part VI The following expert analyses are related (sometimes indirectly) to the situation in Vietnam: Shawn McHale, Cochinchina – a failed revolution? Pierre Grosser, France restored. Shawn McHale, Saigon descends into chaos. Geoffrey Gunn, The Cité Héraud (Saigon) Massacre. Shane Strate, Thailand's support for neighbouring liberation movements. Natasha Pairaudeau and Chi P. Phuong, Indochina’s Indian dimension. Nguyễn Thế Anh, Bao Dai’s abdication and the failure of an imperial project. David Marr, Ho Chi Minh Declares Vietnamese Independence. Geoffrey Gunn,The great famine. David Marr, The Chinese army enters Indochina. François Guillemot, Vietnam’s fractured nationalists. Geoffrey Gunn, The French Permanent Military Tribunal in Saigon. Geoffrey Gunn, Japanese deserters in Indochina. 12 August. After Dai Viet demonstrations in Hanoi the day before, other nationalists rally in the city in support of the royal government and call for unity among the people. 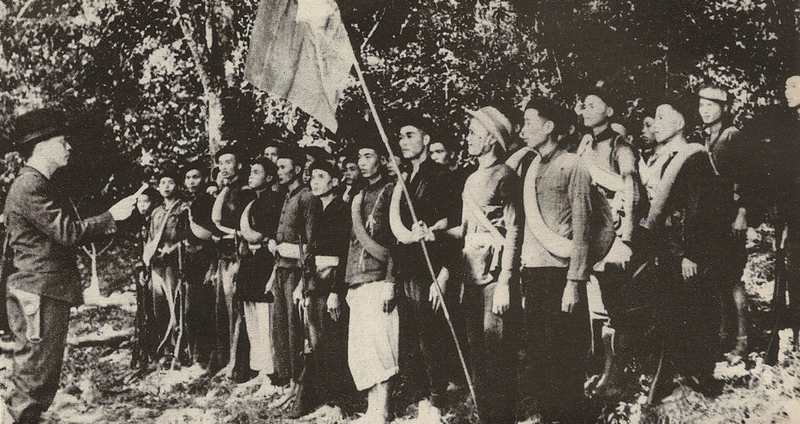 Although next day another Dai Viet demonstration calls on the people to ‘consolidate Vietnam’s independence’, a new meeting of Dai Viet cadres held on the 16th again fails to agree on concrete steps to thwart a Viet Minh takeover. By now, some Dai Viet troops have left their nearby rural redoubt and begun marching on Hanoi. Delayed by flooding, they reach the city only on the 17th and even then fail to receive orders to seize power. 5 August. Premier Tran Trong Kim returns from Hanoi after negotiating with the Japanese Governor-General for reversion of Cochinchina to Vietnamese imperial rule. In Hue, however, he faces a cabinet revolt over his handling of the matter and concerns that the country faces more pressing issues, like popular unrest and the threat of resumed famine. Within two days, all ministers have resigned. When Premier Kim proves unable to form a new cabinet, this technically leaves the old one in caretaker mode. Although the machinery of government continues to function, imperial leadership is disrupted at a critical moment. 11 August. The transfer of local government to Vietnamese imperial control in many cities in Tonkin and Annam, celebrated earlier in August with destruction of French colonial statues and renaming of streets, fails to quieten the growing unrest. Despite stern Japanese warnings against illegal political activities the previous day, fears of the imminent return of French colonial rule bring Dai Viet nationalists out onto the streets of Hanoi to oppose ‘imperialist invasion plots’. That evening, hearing news of a possible Japanese surrender and looking to pre-empt a Viet Minh takeover, their leaders hold an emergency meeting to discuss the seizure of power from imperial authorities in Hanoi with tacit Japanese support. Opinions are sharply divided; some want to take action immediately, others fear being seen by the Allies as Japanese collaborators. No decision is reached at the meeting.